With the objective of building greater awareness and consensus on various issues critical for the country’s growth, CII has launched a monthly publication called Policy Watch. It is widely circulated to all stakeholders, particularly to membership and government to communicate Industry’s views and recommendations across different sectors. 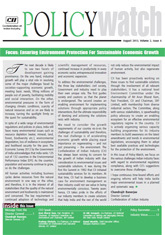 This issue of Policy Watch focuses on various challenges faced by the Indian industry with regard to environmental regulatory compliance and has outlined some specific recommendations to overcome those challenges. 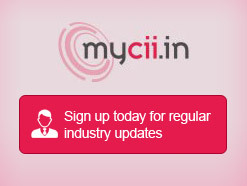 The Indian Industry has started appreciating the concept of sustainable development. More and more companies are migrating away from the “business as usual” approach; as these companies strive to achieve long-term sustainability, they are realising the need to integrate social and environmental issues into business decisions. Against this backdrop, CII has always been voicing its concern for the growth of Indian industry with due consideration to environmental issues and sustainable solutions.